• Listen to BLOOD ATONEMENT songs from "Grave of Humanity" (2012) demo from the band's YouTube channel. It was early 2011, when ex-WARHAMMER guitar player Marko Hoffmann approached WARHAMMER singer Volker "Iron Lung" Frerich with the idea of forming a speed/thrash metal band. They were joined by drummer Klaus Lelgemann and soon the first songs "Grave of Humanity" and "Speed Metal Militia" were composed, showing instantly that this would prove to become a successful new outfit. And what better place in Germany to hail from than North Rhine-Westphalia, where the metal history gave us thrash and speed metal legends like SODOM, KREATOR, WARRANT, DEATHROW, VIOLENT FORCE, ASSASSIN or DARKNESS. 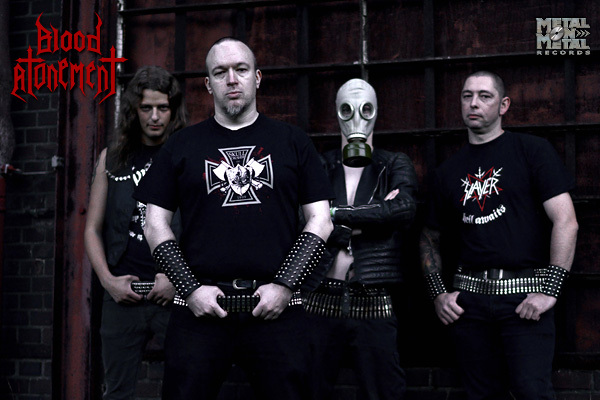 In 2012, after Christoph Erdmann from WARHAMMER and ATTIC joined the band on bass, BLOOD ATONEMENT released the demo CD "Grave of Humanity", comprising an intro and five songs. With the general emphasis being on fast speed/thrash tracks, the song "Asmodeus" also showed a slow doom- and CELTIC FROST-influenced pace, proving that the band does not want to limit itself. The band's style distinguishes itself furthermore from other speed/thrash bands because of the deep, brutal voice of Volker "Iron Lung" Frerich from WARHAMMER, instead of the more common "Mille/Kreator"-like vocal style. The lyrics range from critical religious themes to the dark side of humanity or more abstract concepts like two persons having the same dream. Soon after, Max Werner from ERAZOR joined the band on second guitar. On the live front, BLOOD ATONEMENT played successful club shows with the likes of ATTIC, FATAL EMBRACE, WARHAMMER, PENTACLE, IRON KOBRA, EXPLORER, STEELCLAD, IRON FATE or VON. Another highlight was the participation in East Germany's prestigious Raging Death Date festival, together with KETZER, TRIBULATION, OCCVLTA, VENENUM and many others, on March 31st 2013. Christoph Erdmann left the band in April 2014 after 2 farewell shows, due to time scheduling reasons, and the band is currently looking for a fitting replacement on bass. Meanwhile, Metal On Metal Records contacted Volker Frerich whom they had known for a few years because of his other band, WARHAMMER. Upon hearing the whole demo the label didn't have doubts and soon an agreement was reached. The band's main focus at the moment is on gathering the song material for their first full-length album, planned for early 2015. This will include new recordings of all tracks from the "Grave of Humanity" demo as well as some new killer tunes.